By all accounts, I am a highly-accomplished woman. I have a college education, a PhD and a medical degree. I am an executive director, a physician and a co-founder of a successful non-profit. Despite being an introvert, I have strong social skills and am adept at networking and building community. I have many friends and a wonderful family. I know persistence, determination, resilience and hard work. And I know the Failure Demon. The one that sits upon your shoulder and provides the 40,000-foot macro overview critique of all your deficiencies and failures. My house deal fell through this weekend. It’s been six weeks of sleepless nights stressing about whether it was the right place for my family and finally shifting into preparing mentally to move. The boys were excited, talking about how they would arrange their rooms and all the fun space they would have to play. And the yard. Sigh, the yard. Failure Demon points out that I’ve been looking at houses for over a year. I keep talking about wanting to move and get the kids into a different school system and yet I can’t that done. No house has been the right one and the walls of this rental townhome are closing in on us. Failure Demon likes to point out deficiencies like this when I’m trying to focus on studying. Failure Demon reminds me that despite being a nearly straight-A student my entire life, despite passing every prior standardized test I’ve taken with relative ease, I have now failed my Internal Medicine re-certifying exam twice. I have one more chance. I am in a “grace year” and I’m running out of time. Failure next month will change me from a “Med-Peds” physician to a pediatrician. Failure will change my current employment at a medical office providing care for under- and uninsured patients. Failure will change my income and the ability to afford such things as a house for the boys. Failure will have a ripple effect. Failure Demon reminds me that part of all this stress of choosing a house and choosing a school district is the stress of trying to parent alone and make important life decisions on my own. Failure Demon points out that my life-long goal of finding a partner, a soul-mate, a friend, a spouse is still unmet, still in the failure category. Failure Demon chuckles. For Failure Demon points out that solo parenting isn’t even working out so great, is it? The threatening letters from property management to inform tenants that “all children must be supervised at all times when outside” have now escalated to an email asking for a meeting with the property manager next week. Apparently there’s been a report of Mr. Ornery lighting smoke bombs in the back yard while “unsupervised” the other night while I was at work. Mr. Ornery is ornery; there’s no getting around that. But Failure Demon knows that I am stretched and that trying to keep track of everything spins out of control sometimes. Failure Demon struts and nods smugly. Failure Demon smiles haughtily. Failure Demon loves to torture all of us. But you shall go away, Failure Demon. I will sit here for a moment. I will sit in peace. I will let the sadness of losing the house pass me by and then I will begin again. I will pick up my phone and study more exam questions on that handy app and I shall do my best. I will give my boys a hug and rejoice in their health and their creativity and their love of exploration. I will shake off that demon and rise again. For I have confidence that “In the beginning was the Word. And the Word was with God and the Word was God.” And God’s Word is that we are loved. That we are made perfect through Him and that there is no failure when one walks with God. So go away, Failure Demon. For Christ reigns, friends surround, and there is much work to be done. 47 Things I’m Thankful for on My Birthday! I guess the first thing would be that I got out for a run after putting the kids on the bus (school day number 2!) this morning and that gave me time and mental “space” to think about all the things I’m thankful for! After about the top 11+, they are not really in any particular order (kind of hard to compile the final part with a five-year-old talking incessantly in your ear while wearing an Olaf costume). Super Tall Guy– within all his grumpiness, irritability and anger, he is sweet and loving and trying every day to do his best. Mr. Ornery – ornery as all get out, but such a sweet, creative, snuggly delicious little boy! 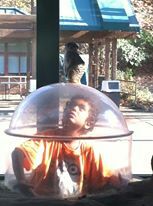 The Little Guy – the most resilient, tender, kind, extroverted being I’ve ever met who approaches the world head on. He’s a game-changer! My parents – their unconditional love, missionary heart, and constant encouragement has meant the world to me. And their current support of my sister and I in our parenting is priceless. My sister – she started us on this journey of parenting and I will never forget that! Love her. My brother and his family – such a faithful, loving big bunch. Wish we lived closer. All my other family scattered around the States and the world! So thankful for them and the love they share. My best friend from college – her boys are just two days older than my three and we commiserate and support each other practically daily. Countless friends who are always there in so many different ways from all my educational experiences (a TON of education) and a wonderful medical community of friends and so many other places. I am so grateful! Our Cavadoodle Mitzy – she’s such a gentle soul….and patient with the boys….soooo patient with the boys! My health – enough to try water-skiing again last month and getting out to run. A fellow foster parent who made parenting a newborn possible ten years by offering to do childcare for Super Tall Guy until he was 6 weeks old and could start at daycare. She made our “story” possible. Growing up as a missionary kid in Thailand as it had such an impact on my life and is my forever home in my heart. The opportunity to travel throughout the world (though the passport became unused once the boys arrived….). Friends around the world thanks to my parents’ wise decision to have foreign exchange students when we were in high school. Living in the U.S. where we have so many opportunities. Super Tall Guy’s “big brother” from the Big Brothers Big Sisters program who has been a blessing to our whole family. Good school for the boys where they are safe and cared for and have many opportunities. Ben & Jerry’s Coffee Coffee Buzz Buzz ice cream – it’s out of this world. Try it. You won’t stop. The fact that Target has just started stocking Coffee Coffee Buzz Buzz! One-stop shopping is key for single moms! Living in Pittsburgh which is a small town big city in which everyone is “related” by only 2 or 3 degrees of separation. Starbucks nonfat no-whip mocha…..just addicted…that is all. Ability to work a job that gives me tons of flexibility at work doing so many different things and and flexible hours so that I can be at kid events and available when needed. Friends that helped me purchase a minivan when my crew grew and three car seats wouldn’t fit across a row anymore! Living in a community with neighbors who help out whenever needed. Texting – I just love texting….I’m an introvert….enough said. Having a home. Even though we’re looking for a new place to move to, it’s nice to have a comfortable place to be in the meantime. A comfortable bed. Beds are wonderful. I can’t wait until all of my boys feel the same way about their OWN beds! Showers are great – especially the first one after a beach vacation and you finally feel like you got the sand out of your toes. Okay – the opportunity to take vacations. Not everyone can and I don’t take them for granted. Grass under foot, trees overhead, flowers in bloom, leaves that change color, snow that falls. Fireplaces – I love fireplaces. And garages, oh how I wish I had a garage (it’s on my bucket list before I turn 50!). A basic ability to cook and a joy of baking. The opportunity to live in peace and safety (most of the time). Having a big “safety net” around and under me when it’s needed. My grandma’s piano in the living room and an occasional moment to tickle the ivories. Jigsaw puzzles – always a soothing activity to me. Access to technology and a basic understanding of it so that I can communicate with it, compile memories through it, and connect with others. A little wine or beer or margarita sprinkled into life. Knowing that I am loved. Donald Trumps says things that I discipline my children for! Reflecting later, I realized that one of the front runners in the political field this year is a man saying the very things to which I dole out serious consequences. I am working hard to shape my young boys into caring, considerate, compassionate men and I have before me the very antithesis of this behavior seeking applause from his supporters. Here, one of America’s most “powerful” men (only because people seem to want to equate power with money) is expressing his desire to punch another human being in the face in response to an action. What do I tell my boys over and over? “We use our words. We do not hurt other people.” “Hands are for helping, not hurting.” It is in their very nature to respond physically. My boys are always wrestling. They are always walloping each other. It is with time and with love and with constant correction that I shape them to respond to each other with kindness, to see another’s point of view, to control their temper and their bodies, to seek peace and reconciliation. It is an exhausting process and yet I persist because it matters. There were 23 mass shootings over the course of 20 days starting February 19th, from California to our neighbors here in Wilkinsburg. Across 17 states, 128 people were shot and 42 died (from Esquire). There is unspeakable grief for at least 42 families. And, this is just “mass shootings” and doesn’t count the shooting deaths of just 1 or 2 people (like the remarkable physician in Texas who was killed by her husband last week, leaving two young children behind). Should one of our most visible “leaders” be promoting violence, the kind of violence that kills people? The kind of violence that takes kids from their parents, parents from their kids, brothers and sisters from each other, best friends split forever? Violence that leaves emptiness and pain in the hearts of so many. Violence the type that I talk to my sons about and ban them from video games that make it seem realistic and that disassociate it from the pain and consequences it produces. I don’t even know where to begin on this one. I am a single woman raising three incredible sons whom I adopted from the foster care system because there are kids in this country who need a family and need love. And I am trying my hardest to raise my sons to respect people – all people, men, women, children, people of different backgrounds, people of different faiths, people of different skin tones (because our household is a blended tone one), people of all walks of life. In fact, I am teaching my boys not to treat anyone like s—t! I am a lucky, lucky mother. My children are young. They do not watch the “real” TV, they watch episodes of Pound Puppies and Octonauts. They are not exposed to the news. They probably don’t even know that Donald Trump exists. I am lucky. I do not have to explain (yet) how a grown man who is displaying so many things that every parent works to correct in their children is getting so much attention. I do not have to explain why people are afraid and how their fear is driving their praise of this behavior rather than disgust. I have time to prepare. The other day, I made a little video on my phone of my youngest boy. Of course, I had to have him repeat his question for the video because the first time he asked, I didn’t have any video recording running. I should just run video nonstop at my house. After all, I have three boys – feel sorry for me. They’re actually 4 words in total, but they roll of my tongue so rapidly and frequently that it seems as if it’s just 2 words after all. I can’t even count how many times a day I say these simple “words” but clearly enough that the boys identify them as frequently used enough to completely ignore them. And they are right – these words are entirely ineffective. The other day, Super Tall Guy lay on the floor wiggling and kicking around his feet. I kept repeating “quitit” “Quit IT! !”….he kept moving. I kept getting frustrated seeing all the papers that were being scattered and how he was kicking into Mr. Ornery also rolling around on the floor. “Quit it!” and yet he was not stopping. Clearly my words were not helping him understand what his behavior was and why it was such a problem. “Super Tall Guy, please stop moving your feet around. You are messing up my papers and kicking your brother.” “Oh,” he replied, “I didn’t know.” My first thought was ‘how in the world would you not know? Don’t you feel yourself knocking into things?!? What’s wrong with you?’ But that question is not helpful. My commands were not helpful. I needed to educate him on exactly what was the problem and help him see how he was affecting the world around him. “Yes, Little Guy, when you make that noise near me it makes my brain feel really crazy and Mommy doesn’t like it. But you can make that noise in another room if you want to.” Now the Little Guy can make an association between his behavior and how he is affecting the world around him. He can also choose to make annoyingly obnoxious noises in another space if he would like (for example, beside his older brothers who just punch him or start copying him!). What he now knows is that Mommy doesn’t just yell “stoppit” and “quitit” all the time for no apparent reason. I mean, I do. I do say them all the time. But the first step to change is admitting you have a problem. And visualizing the change you want to be. How do you build persistence? I walked into Brighton Music Center last week. I thought I would be carrying a big bulky cello with me to return the rented instrument. For the past several months, Super Tall Guy has said “I’m quitting” every single week after cello and then orchestra practice at school. Every single week. “I hate missing recess” (happens rarely). “I hate taking it on the bus” (not even once a week does he do that). “I’m not going to practice” (that’s true – he hardly ever took it out of his case at home). I wondered if it would be okay to return the instrument the day after the concert. We’ve never had an instrument in the house other than the piano which is definitely out of tune and woefully neglected by the only individual who can create a tune on it. I just didn’t want to pay a month’s worth for just two days of cello use. The day of the concert was the first day of real snow of the season and we braced ourselves against the wind walking to the auditorium. Kids wandered up and down the aisles. Parents searched for rows that had enough empty seats to meet their “save me a seat” requirements. Super Tall Guy meandered to the front to join the throng of kids waiting to have instruments tuned by very patient music teachers. And then they began. It took a few notes, but soon each song became recognizable. Most of these third graders started four months ago without any musical ability. It was not until last month that they started to use the bow rather than just plucking the strings. 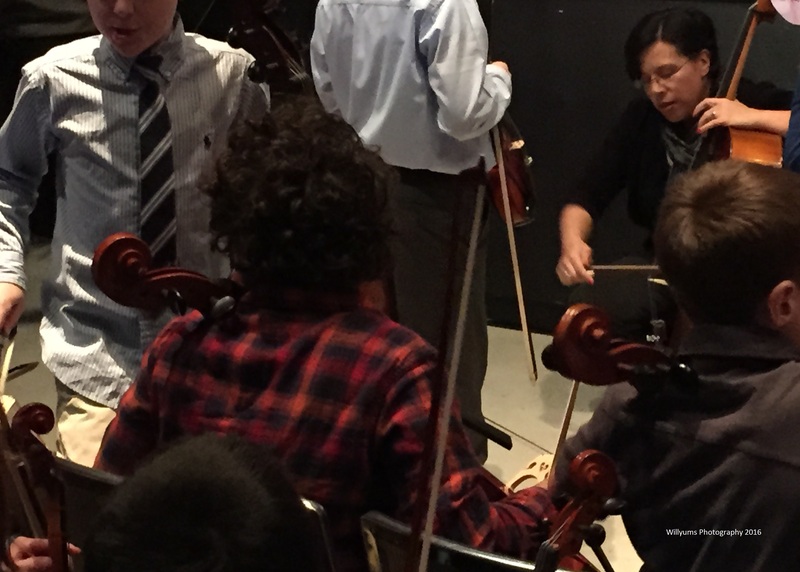 It’s an impressive feat for a music teacher to turn 70 rambunctious 8 and 9-year-olds into musicians. “Well, Super Tall Guy,” I queried as we stepped out into the night, “What did you think?” “It wasn’t bad” – and voila, we’re not taking the cello back yet, I thought to myself! “Maybe some day you’ll be playing Cello Wars Lightsaber Duel!” “Nah, it makes blisters on my fingers.” Ah, sigh…. I’ll just rejoice in the fact that I’m plopping down a check on the music store counter instead of an instrument and hold out hope that he’ll persist for a bit longer with the cello (maybe at least until the Spring Concert). And I’ll be grateful for a passionate music teacher who inspires new musicians, a committed homeroom teacher that sends reluctant kids down the hall to practice, great music stores that make it possible to try instruments, and a school that supports musical arts. And the PianoGuys who end their Cello Wars video with the Jedi Mind Trick “you will start cello lessons now”…. If you’re a mom and fighting a cold, you might just close your eyes while sitting on the couch in the middle of the afternoon. And if you close your eyes after a long week of work and the end of the first-week-back-to-school, you might just fall asleep. And if the single mom falls asleep as it gets closer to five o’clock, the resourceful unsupervised boys might just make their own dinner. And if two young boys decide to make their own dinner, they might just pour out a bowl of cereal and head upstairs with a large number of Hershey Kisses piled on top. 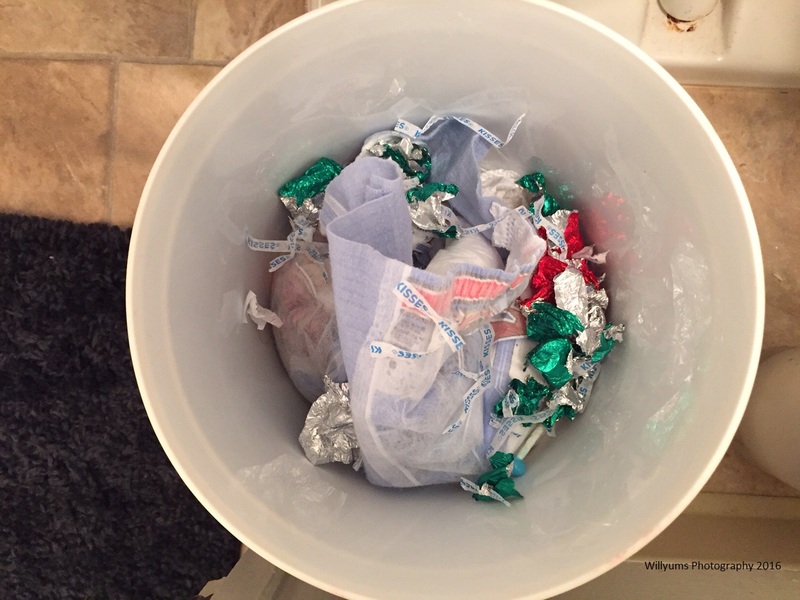 And if the boys are wise enough to know that they’ve taken far too many “treats” they might just try to hide the wrappers in their bathroom. And if the boys mention getting some more treats as they walk past the couch, they might just wake up their mother who then decides to explore the little house and see what the boys have been up to during her absence. And if the mom finds evidence of all this unhealthy eating, she might just send the little squirts off to their room for a break so that she can sit down on the couch. 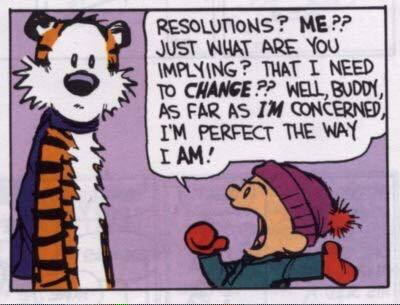 New Year’s Resolution number whatever – beware the first week of January. It will knock you hard. Respect it. Respect the disruption it holds on your life. Respect the toll of exhaustion on little bodies as they try to “align” themselves with the routine again. Respect the stress on your own life as you readjust to work and wade through all that has piled up in your absence. Be more patient with those little creatures and with yourself. Rest more. Forgive more. Remember that it’s okay to say no to good things. Do you know why parents have to talk to each other so much? They have to float ideas out there to make sure they’re not crazy. “Seems to me that a 7:00 pm practice is a bit late for a 6-year-old….” “Oh, yes.” “I know, right? It just throws off our whole evening!” “Uh, hmmm.” Check, yep, I’m right. We’re going to have to start skipping those late evening basketball practices and get a bit more sleep. New Year’s Resolution next in number – support one another through those crazy stressful times. Encourage each other and take naps as often as you can! You know … you really have to watch your assumptions when you’re a parent. With this opening line, I could go anywhere, couldn’t I? But I shall try to tie this in. Super Tall Guy is an extraordinarily shy guy. At least he seems to be. At least that is my assumption about him…built on a vast number of facts such as hiding behind my body on too many occasions to count, refusing to speak to someone that I am conversing with, and many other examples. However, every once in awhile, he isn’t shy and I am generally taken aback and don’t know how to respond. This weekend we had a sunny and warm Saturday morning (wow – mid November!) and so we strolled along the zoo enjoying the quiet of the morning. We eventually stumbled into the Polar Bears’ Birthday Party (who knew that Koda and Kobe are 8 and 11 years old….but I can’t remember which is which). All the crafts and activities and yet Super Tall Guy was Super bored until Radio Disney said they were going to have a hulu-hoop contest. He raised his hand and bounced “pick me, pick me.” I stood awestruck and watched him go forward. He easily won the first round – probably since the Little Guy was one of the 2 opponents, and then he went head-to-head against a very graceful school-aged girl. He was quite disappointed to lose. I was quite shocked to watch him compete. It was touching on the way home when he mumbled in the back of the van, “I was sad not to win the hulu hoop.” I still shook my head in disbelief and said, “I’m proud of you for getting up there.” Where does this come from? My other big really bad, definitely more significant mistaken assumption over the past couple weeks was related to Super Tall Guy’s first grade homework. For the month of October, they were expected to memorize Psalm 100. It’s a long one and I didn’t really understand it as homework and really thought that STG wouldn’t be interested in memorizing and wouldn’t have the brain-power to do so. Hence, I never reviewed the verse with him at home. Tuesday, the 30th, he lay in bed before falling asleep and recited the whole thing. I pounced on him with joy. He said “do that again,” and I body-slammed him again! (apparently this is the kind of praise that he likes). I confessed my apathy to his teacher the next day at the conveniently scheduled parent-teacher conferences and I promised in my head that I would never underestimate him again (until I do) and would do better at working with him on homework (until I don’t). But reflecting on these few examples tonight makes me realize how I shape his experiences based on my assumptions of what he will and will not like. I love that he surprises me, but I hope that I’m not denying him some really fun and rich experiences based on my own judgment call. More importantly, I need to be wary of not challenging him to his fullest potential, but to expect the world of him …. and body-slam him whenever he proves me wrong.